Room for More: Quaker Week leads to Quaker year! Did you visit the ResisTENT venue during Greenbelt 2018? If so, you’ll have met some Quakers and maybe heard something about death, parrots, disarmament or done some kite-flying. You may even have enjoyed the silent disco, where more than one set of headphones chose the ‘Quaker silence’ channel! Perhaps you’re thinking you’d like to know a bit more about these quiet, quirky people of God? If so, in the week after ‘Quaker Week 2018’ (a weeklong series of open events at many Quaker meeting houses where you can meet more Quakers and enjoy a shared meal, talk or get stuck into taking action in the world) why not take a look at what your local Quaker meeting house is up to and pop along to see for yourself. More than 2,300 people passed through the Quaker ResisTENT venue at Greenbelt and gained a sense of the power of stillness. Of listening for that small voice in the silence and the connection between worship which inspires action and the witness that informs our worship. Quakers believe in a transforming experience of faith which calls us to be change makers in the world. 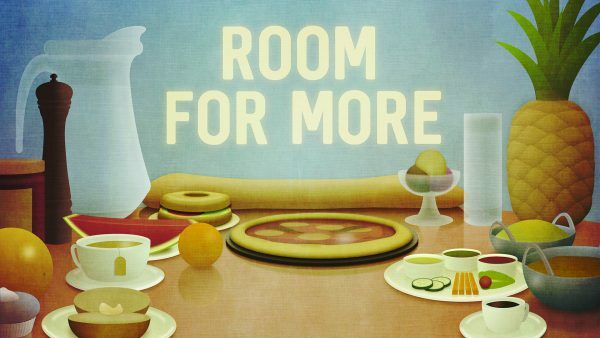 This year’s Quaker Week theme was ‘Room for More’. Quakers offer a table rich with good things, but each person brings their own dish – gathering around the table together is what informs and enriches our spiritual experience. That’s always the case at your local Quaker meeting house. Why not see for yourself. Bring and share lunches and evenings were held up and down the country – see the interactive Quaker Week map. There were family craft days, theatre and storytelling evenings, craftivist afternoons and more! And this activity continues year-round. So, if you experienced Quaker worship at Greenbelt then join us online, on a Sunday morning or maybe a weekday evening – find a Quaker meeting near you. Gill Sewell is Ministry & Outreach Officer for Quakers in Britain and put together the Quaker presence at Greenbelt 2018.